Having a dinner consisting only of soup is recommended by Joel Harper, a celebrity trainer, as a great way to lose weight. You might wonder why it helps. Well, soup is considered to have more filling per calorie thanks to the water in it. Researchers say that soup can keep you full for a lot longer period of time per calorie than eating the same foods in dry form. The reason for this is that soup turns off the hunger much sooner as it occupies more space in the stomach. However, not all soups work like this. The following are 5 delicious weight watchers soup recipes with different ingredients that you can choose from. 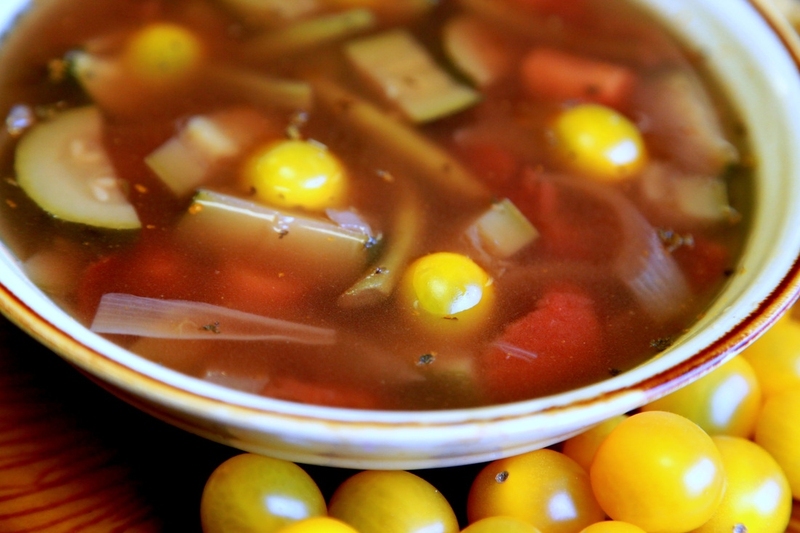 One of the best soups for a person wanting to keep his weight in check is the cabbage soup. It has both flavor and taste and at the same time it is very healthy. 1. Sautee the carrots, onions and garlic in a non-stick pot for about 5 minutes. 2. Add cabbage, green beans, tomato paste, broth, oregano, basil, salt and pepper for seasoning. 3. Let the pot stay on the stove for about 5 to 10 minutes to tenderize the vegetables, then add zucchini and let the pot rest on the stove for another 5 minutes. 4. You can adjust the ingredients like increasing some amount of ingredients while decreasing other if you want to when making a different variation of this soup. Egg drop soup with chicken is among the great weight watchers soup recipes which can go a long way in ensuring that your weight remains in check. It is easy to prepare and extremely delicious to eat. 1. Add chicken stock and soy sauce into a saucepan and bring it to boil. 2. Add chicken, green onion and peas to the saucepan and again bring the mixture to a boil. 3. Remove the saucepan from the stove and drizzle the egg in a slow manner. Let the mixture sit for one minute so that the egg can set properly. 4. Before you ladle the soup into the bowl, don’t forget to stir it gently first. Cauliflower and/or broccoli soup is one of the healthiest weight watcher soup recipes that provide you many calories with little fat and quickly put an end to your appetite as well. It is a soup that you should definitely give a try. 1. Dice broccoli or cauliflower. 2. Chop down the ½ cup onions and slice 2 cup of carrots. 3. Add all of the ingredients except the salt and pepper into a 5 quart saucepan. 4. Cover the saucepan and let the vegetables simmer for about 20 minutes so that the vegetables get tenderized. 5. Strain some water but preserve the bulk of the liquid. Puree the vegetables in a food processor. 6. Add the pureed vegetables and the liquid you preserved into the saucepan. 7. Sprinkle salt and pepper for seasoning and re-heat. Celery onion and spinach soup is among the best weight watchers soup recipes that do not take long to prepare and is extremely beneficial for weight conscious people. 1. Add chicken bouillon cubes and water in a large pot and turn on the stove. 2. Add the frozen onion and spinach along with celery in raw form and set to boil. 3. Stir the pot frequently so that the bouillon separates and the flavors of the vegetables seep into them. 4. Boil the soup for about 5 minutes. And then simmer the soup for about 10 to 15 minutes. 5. Add pepper for seasoning and enjoy the soup. Black bean soup is one of the best weight watchers soup recipes which provide a filling. Moreover, it does not take much time to prepare. 1. Put garlic, onion and celery in olive oil and cook them at medium-high heat until they become soft. 2. Add the chicken broth, coriander, black beans and cayenne pepper in the mixture and let it simmer uncovered for10 minutes. 3. Stir balsamic vinegar into the mixture. 4. Garnish the soup with cilantro and serve it warm. Server responsed at: 04/22/2019 4:57 a.m.